Rats are some of the most intelligent species of rodents in the world. They are cautious, hardy, and aggressive. These qualities make rats much more difficult to trap than other types of rodents that can infest homes, such as mice or shrews. 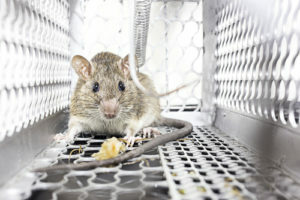 A live, trapped rat will attempt to escape and will attack anyone who comes close—potentially spreading disease with a bite or scratch. A rat trap placed on the rodent’s normal foraging path will almost always be avoided since rats are wary of new objects on their trails. Rats are adept at creating holes in various hard-to-find locations throughout a home. Trapping a rat is almost impossible without locating all of its locations for escape and entry. Professional pest control agents like the ones at Critter Control® of Dallas will always inspect a property from top to bottom to find all of a rat’s nests, points of entry, and exits. This allows the exterminator to place traps or poison in the best locations to catch all of the rats living in the nest. Rat trapping should be handled by professionals because of the many health risks they pose. A homeowner may be able to trap or poison some of the rats, but if the bodies are not quickly removed, diseases may fester in them. Any living rats can pick up these diseases and spread them. Critter Control® of Dallas will not only kill all of the rats in a nest but will also quickly and safely remove the carcasses. This lowers the chances of any person contracting an illness from the dead rodents. At Critter Control® of Dallas, we can provide you with expertly trained rat trappers. Homeowners can rest assured that the job will be done the right way. If you have any questions, or would like a free consultation, call us today at 817-222-1101.